Find Us: Where is the Falk College Admission Office located? Falk College Admissions Office is located in White Hall – Room 340. From the main campus, White Hall is to your left. You are actually entering the third floor of the building and the admissions office is the first office on your right.If you are coming from the Irving Avenue garage, take the elevator to the 5th floor then cross the pedestrian bridge. Our Irving Avenue entrance is directly in front of you. The admissions office is on the 3rd floor level. Visit Campus: How can I learn more about Falk College during my campus visit? We are pleased to offer prospective Falk students and their families information sessions and tours of our building with a member of our admissions office. These visits generally last between 30 and 60 minutes. They can be scheduled at a convenient time before or after your main campus information session and tour. Please register for the main campus information session and tour. You can search options and dates for visits on our undergraduate registration website. Be sure you sign up to visit Falk after the university information session and tour. On dates when the Syracuse University Office of Admissions is hosting Orange Preview events, Falk College will have an information session scheduled as part of the day’s activities. These events are a great way to learn about Syracuse University academics and student life, all in one day! Orange Preview: How will I learn more about Falk College during my visit on Orange Preview days? On dates when the Syracuse University Office of Admissions is hosting open house programing, Falk College will have an information session scheduled as part of the day’s activities. The general reception days are a great way to learn about Syracuse University academics and student life, all in one day! There is no need to contact us to schedule an appointment if you plan on visiting on one of these days. Your reservation will automatically be scheduled when you register online! Meet Others: Will I get to meet with current students and faculty or sit in on a class during my visit? When appropriate we customize our visits to meet the particular needs of our prospective students and their families. Current students and faculty are available during most of our campus reception days. Getting Admitted: What is the criteria for successful admission into Falk majors at Syracuse University? Our main admissions webpages offer the answers to all questions concerning admission criteria for Falk College. We always encourage students to participate in career related volunteer activities and shadowing opportunities while in high school. These experiences enable you to learn more about your intended major and career path. Choosing a Major: I’m not sure what major I want to study at Syracuse University. Is this a problem? At Falk College you have the ability to explore educational opportunities by entering as an undeclared student. We have an expert student services staff that will help you choose the right major for you. Most majors at SU have over 50% of their curriculum housed in the College of Arts & Sciences. Students that are still exploring will begin with courses in natural and social science, humanities, math and English. 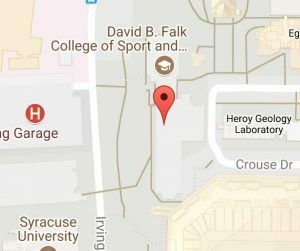 Changing Majors: What if I decide to change my major after I get to Syracuse? It is important to note that many students change their major and career aspirations while in college. This is very normal! If that major is housed in another college at Syracuse University, our counselors will advise you of the guidelines for intra-university transfers. Most majors are easy to transfer into. It is important to note that there are a handful of majors at Syracuse University that are more difficult to transfer into due to space considerations. All intra university majors have their entry criteria available on the individual department web pages.